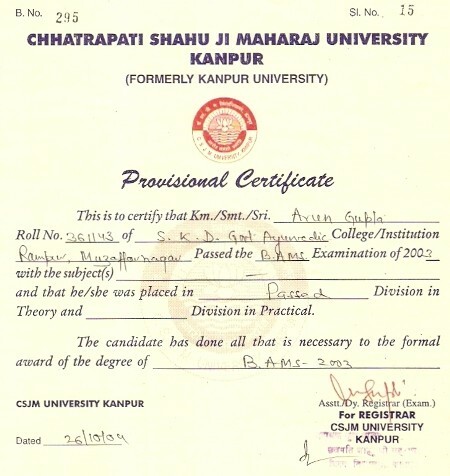 Dr. Gupta graduated from Chhatrapati Shahu Ji Maharaj University (Kanpur) with a Bachelor of Ayurvedic Medicine and Surgery (B.A.M.S.) in 2003. He then completed a 6 Month Allopathic Internship at P.L. Sharma District Hospital (Meerut, UP) and a 6 Month Ayurvedic Internship at the State Ayurvedic College and Hospital Rampur (Mazaffarnager, UP). Since 2005, Dr. Gupta has worked at the Panchakarma Division of A Unit of Art of Living - a Panchakarma Clinic in New Delhi.